An example of a simple drystone retaining wall with base and filler. A natural occurrence can cause some serious damage to any landscape. Things like soil erosion, uneven landscape, and even lawn aesthetics can have people asking question on what they should do. One popular solution is building retaining walls in your yard, and this can solve several problems at once. Retaining walls are used to hold back excess soil in areas of extreme elevation change. Walls can also be used to create flowerbeds and add a more aesthetic finish to any yard. When looking to introduce a new retaining wall to a yard it is important to know the basics so that you are not left with an unsubstantial wall. The first and most important part is the base of the wall. 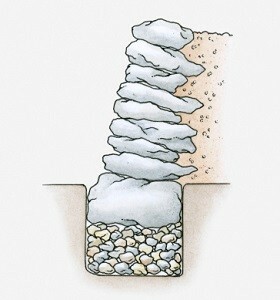 Without a strong base it is impossible to create a strong retaining wall. The base of the wall depends on how high the wall is going to be. Basically, the higher the wall the deeper in the ground the base is. A strong base has at least a six inch layer of gravel and sand reinforcing it underground. It cannot be stressed enough how important it is to create a strong base for the retaining wall. Without a strong base, it opens the door to many other issues such as cracking or leaning. Other than the base, the backfill has to be the second most important part to a strong retaining wall. The backfill refers to the extra soil and filler that is placed right behind the wall to create a drainage system. Since water cannot pass through the walls it is import that the landscaper pays a little extra attention to the backfill. It’s important that at least 12 inches of gravel and soil be placed behind the wall to create a drainage system. The next step is to add a perforated pipe on the bottom of the wall for water and create small holes in the wall for water to pass through. These are all very important steps and if they go unaddressed the wall could potentially rupture as it acts as a dam during rainfall. The final step in the process of designing a retaining wall is the height. Most landscapers recommend staying in the 3-4 foot range. This is because this height provides excellent support and is aesthetically pleasing. Another benefit to this height range is that there does not need to be extra support systems such as anchors installed. Keeping walls at 4 feet or below means a savings in cost as additional equipment, landscaping, and additions can be avoided. Living in an area with a disadvantage as far as landscape can be difficult, but thanks to modern technologies, many of those issues can be solved. By introducing a retaining wall can transform your yard is some many ways, from preventing soil erosion to bring depth to your landscape. If you’re interested in learning more, contact the landscaping experts at Greener Horizon and see how a retaining wall can change your landscape.